Build your network. Ask your friends, family and close colleagues for names of people who should get your résumé. Share your résumé with them so they know your goals and qualifications too. Keep track of who referred you to whom and periodically let your whole network know how your search is going. Networking may not pay off until the seventh level but it does result in the best jobs and opportunities. Research companies at your local library’s reference section and/or using the Yellow Pages. Target a minimum of 25 companies. Call those companies and ask for the name and title of the person you feel will be most interested in your qualifications, i.e., if you are in Accounting, get the name of the Accounting Manager. Get your résumé into the hands of the decision-maker, not Personnel/Human Resources. 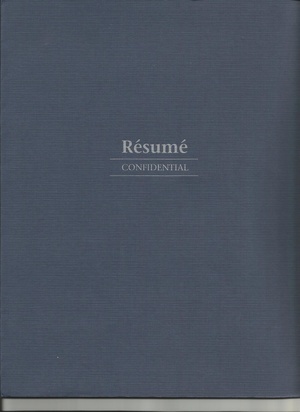 Send your résumé and cover letter in a 9 X 12 envelope so it will arrive unwrinkled and attractive. Avoid Faxing or e-mailing your résumé …your beautifully printed résumé is a powerful calling card. Unless requested, do not enclose your salary history. Do not mail your references. Tell the person requesting them that you will bring them with you to the interview. Keep a record of where you sent your résumé and the date so you know when and to whom your follow-up letter should go. Do not expect many responses to your initial contact. Wait seven to ten days and send your target companies/executives your follow-up letter and another copy of your résumé. Don’t be afraid of being viewed as persistent. Employers value employees who are persistent, well organized and who like their company. You not only will display these qualities, you will be one of the few applicants who will be actively following up after the initial résumé has been sent…and you won’t have to lie to a secretary. “Hello, my name is __________, and I am the person who is so interested in your firm that I have now sent you two copies of my résumé. I am calling today to arrange a short meeting with you in order to discuss how I can contribute to your organization. Would (day & time) be best for you, or would you prefer (day & time) . *NOTE: You have now identified yourself as the one job seeker in 300 who is ambitious enough to contact employers again and sent a second résumé…You’ve asked for a short meeting instead of a “lengthy” interview…and you gave them a choice to make, instead of a decision. Your goal is four or five interviews out or your 25 targets. Don’t feel rejected by the rest; you left behind a very good impression. After you are called for an interview, find out as much about the company as you can. Memorize the name and title of the interviewer. Be sure you know the route and time of travel to the interview site. DON’T FORGET THE DATE AND TIME OF THE INTERVIEW AND DON’T BE LATE. Prepare your outfit. Get a good night’s sleep and allow enough time for proper grooming. Dodge the salary issue! If you tell them what you are currently making or your “expectations,” they now know. Close each first interview so they remember you! Summarize the fit between their open position and your accomplishments. Then HAND OVER your Reference List with the statement, ” I would appreciate it if you had my references checked immediately. That way, when I come back next week/later this week for the next interview, we can move forward. *NOTE: Hooray, you closed the sale! You also got the interviewer to agree you are coming back for another interview. This is our “stealth” tactic to end first interviews on your terms. Feeling shaky about your interviewing skills? Gotten interviews but not the job offer? Loved the position and the company but the salary was not acceptable? Call Maureen Woodruff at 240-334-6538, to schedule Interview Coaching that will get you the position you want and Salary Negotiation Coaching that will nail down the $$$ that you are worth!